"One of the most compelling country talents to come out of Nashville" (Vulture). 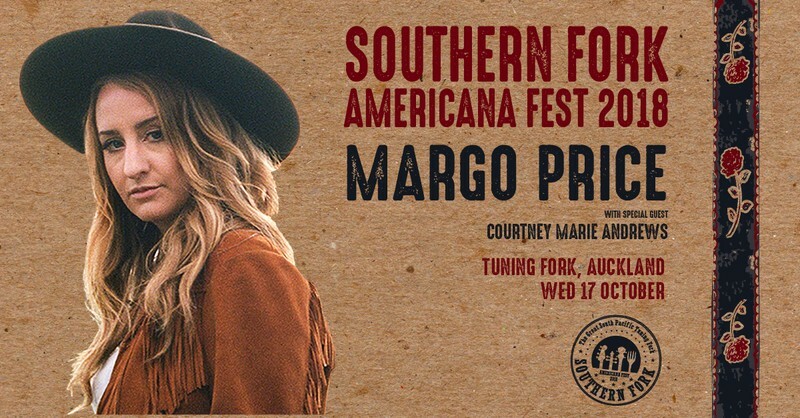 Margo Price's first solo album Midwest Farmer's Daughter debuted in the top 10 on Billboard's Country Albums chart and graced Best-Of lists everywhere from Entertainment Weekly to NPR Music. Most recent release, All American Made was written alongside partner/husband Jeremy Ivey and unapologetically depicts the trials of everyday life, politics and sexism. It was hailed as "a potential classic," by Pitchfork and Rolling Stone praised its "amazingly vivid songcraft". Passing up on a more slicker, polished sound, Price has been lauded for her commitment to the grit and honesty in her music. Courtney Marie Andrews is delighted to return to NZ once again, "New Zealand, I adore your beautiful country and I can't wait to make my way back there the third time!" She played her first NZ show in July 2017 following the success of her album Honest Life. The crowd described Courtney's performance as "exquisite", "utterly brilliant" and Courtney herself said the downunder tour was "pure joy". So much so that she came back that November and delighted the crowd with news that she'd return again with a new album. And that she will. Recorded over eight days and produced by Mark Howard (Lucinda Williams, Bob Dylan, Emmylou Harris, Tom Waits) Courtney revealed May Your Kindness Remain a record dedicated to the people she met on the road.